Image 1 – Photo of AFP team meeting. 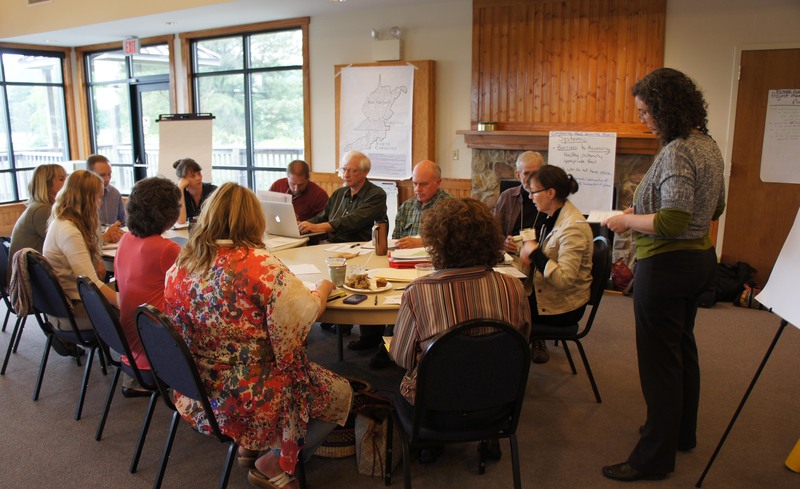 In the blog on May 4th, Propositions for Organizing with Complexity; Learnings from the Appalachian Foodshed Project (AFP), Nikki D’Adamo-Damery described nine propositions that emerged from the work of the AFP. Proposition #2 was: “Establish Consent instead of Consensus.” The following story describes one of the experiences that led to this proposition. This arose when the AFP management team met to award mini-grants to on-the-ground projects that addressed community food security. 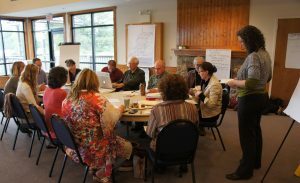 The team included the principal investigators, graduate students, extension agents, and representatives from community-based organizations, and so reflected some of the diversity of the system within which they were working. The team was using a collaborative decision-making framework, and the basis for decisions was the principle of consent. People often think there are only two choices for how we make governance decisions: by majority or consensus. Most people fail to realize that decision-makers have a third option – decision-making by consent – that can be preferable to either of these for governance decisions. 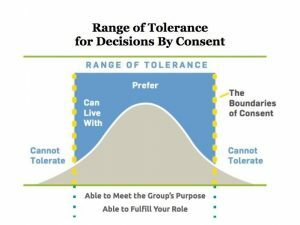 The Consent Principle means that a decision can be when no member of the group has a significant objection to it or when no one can identify a risk the group cannot afford to take. Meaning, the proposal is not out of their Range of Tolerance (see Figure 1). Those risks are things that would undermine the purpose, or that would create conditions that would make it very difficult for a member to perform his or her role. Image 1 – Tool used by group to identify tolerance in decision making. The urgency to get the funds out into the field put pressure on the team to make a decision. On the one hand, there was clear value in having these different perspectives at the table as they discussed funding priorities and how to make the application process more accessible. On the other hand, there were conflicting opinions when it came to designing the application. Was it ethical for representatives from community agencies who might apply for the grant funds, to design the actual application? A professor said “no” and a community agency rep said “yes.” There were concerns that the difference of opinion might limit progress. It was through this experience that they learned that, by using consent as the basis for decisions, the team did not have to agree. Instead of debating, they inquired into what was out of the range of tolerance for each of them. They listened to each other’s objections as feedback about potential risks so they could adjust the solution to mitigate those deemed unacceptable. The professor was actually concerned that there might be a perception about a conflict of interest if the community partners applying for awards were involved in the design of the application questions. That perception was the risk the project could not afford to take — because it would undermine the project’s credibility and trust in the community. The non-profit director was concerned about the integrity of inviting community reps into the decision-making process, and then withholding that power when issues got sticky. That power dynamic was a risk the project could not afford to take — because it would undermine the trust within the core team. Once they discerned the reasons for concern – and chose to respect what was important to each of them – they found a way forward. The decision was to include the community partners in decisions about the application design, as full decision-makers, AND to be fully transparent in all public communications about their participation. As a side note, they were simultaneously clear that, if one of those community-based organizations applied for a grant, they would recuse themselves in the selection of grant recipients. The grant application design and process went mostly smoothly with no conflict of interest issues. The second round of distribution of mini-grants moved even more quickly, building on the trust that had been built the first time around. *The Appalachian Foodshed Project (AFP) originated in 2011 as a grant funded through the USDA’s Agriculture, Food and Research Initiative (AFRI) grants program (Award Number: 2011-68004-30079). Virginia Tech served as the lead academic institution in partnership with North Carolina State University and West Virginia University for a five-year endeavor to address community food security in western North Carolina, southwest Virginia, and West Virginia.